Nelson Wine Estate is a family owned estate that is located a mere 40 minutes from Cape Town in the foothills of the Paarl Mountain. Surrounded by vineyards and lush green lawns, our three beautiful venues each have their own style. 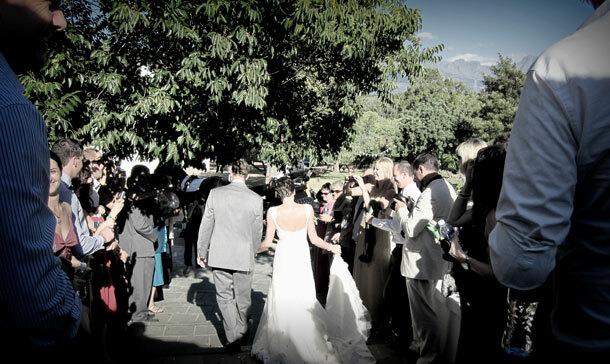 The Mountain View, biggest of the three venues and fully draped in white, has a spectacular view from its large windows and balcony of the Stellenbosch and Du Toitskloof Mountains. This venue can accommodate up to 350 guests, banquet style, with a dance floor and up to 700 conference delegates, schoolroom style. Entering from the wooden veranda, The Lapa Venue, also fully draped, can seat up to 110 guests, banquet style, with a dance floor and for corporate functions can accommodate up to 180 guests, schoolroom style. The Lapa overlooks the gardens and pool area. The smallest, but not the least, is The Old Cellar venue, circa 1687. This rustically built thatched-roof venue oozes olde world charm and is perfect for intimate functions of up to 40 guests as well as for small conferences. It is also an ideal venue to use as a chapel. The garden, partially covered with shade of age old oak trees, and with a huge pool, makes for beautiful outdoor ceremonies and receptions. It is also an idyllic setting for festivals and events. We also have 12 double rooms on the estate for guest looking for accommodation after the wedding. 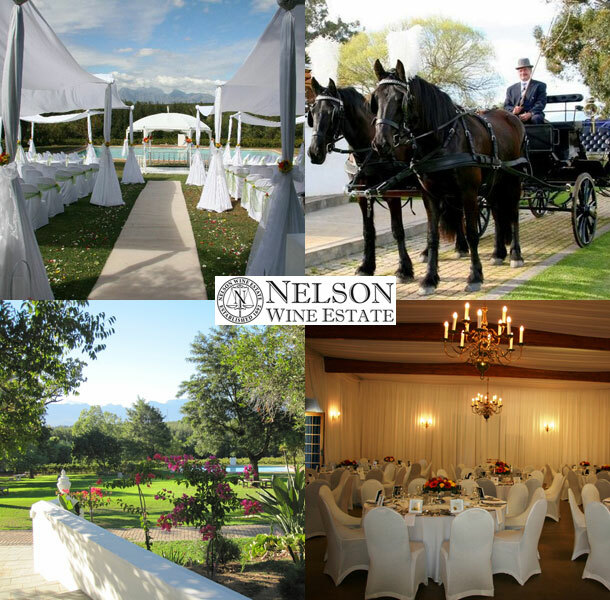 To book your wedding at this lovely venue visit Nelson Wine Estate for further details or to send an enquiry.